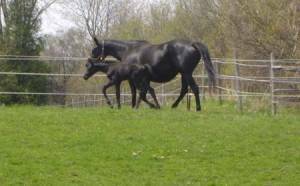 Black Lightning Horses Inc. is located in Rockwood, Ontario on Fifth Line Nassagaweya in a beautiful rural area on a quiet side road within easy commuting distance to Milton, Guelph, Fergus, Kitchener, Mississauga, Toronto and the Greater Toronto Area. Located just minutes from Highways 401, 25 and 7 our location is accessible in all seasons. Black Lightning Horses Inc. puts a very strong emphasis on the well being of all the horses at our facility. Everything is set up to provide the animals with the best possible care. A bright, well-ventilated barn, home grown horse feed, large, lush pastures with all day turnout and excellent health care make our stables unique. Our customers are happy because their horses are happy. To meet our boarders competitive needs European German certified coach and trainer Petra Buttner offers high quality advice and service in equine care, coaching, training of horses and clinics. Black Lightning Horses Inc. is recognized member of Equine Canada and Ontario Equestrian Federation as well as member of the Dressage organization of Canada, Cadora. The facility is surrounded by 150 acres of fields and bush with several ponds and creeks that can be used all year round for hacking. Owner and rider Petra Buttner's international reputation as highly respected horse breeder and trainer led to the formation and success of Black Lighting Horse's Inc. In 2000 Black Lightning Horses Inc. started as pure breeding operation of Trakehners (German Warmbloods) with a few selected broodmares and an approved stallion, which were imported from Germany. 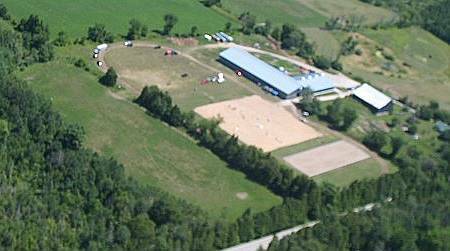 Soon after Black Lightning Horses Inc. expanded its business to offer boarding, lessons and training in its brand new facility with a 25 stall barn and a 200' by 80' riding arena and training facilities – one of the biggest arenas in Ontario. 2004 saw the addition of horse sales, horse shows and trailering services and quarantine barn for importing horses. In 2005 we completed the outdoor Dressage and jumping rings so that we could host bigger outdoor horse shows and clinics. After many successful years in the horse industry the focus changed back in 2010 to breeding only and we are now selling most of the horses because another business venue takes up most of our time. The main barn was finished in 2002 and is built in an open concept. Lots of windows, the clear ridge, the open ceiling and stalls with grill tops all around make this barn exceptionally bright and airy. Four huge vents and climate controlled fan keep the building well ventilated and the insulation throughout the entire barn provides even and modest temperatures in summer and winter. 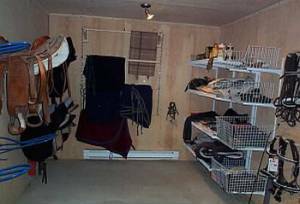 Tack room, separate feed room and the washroom are well lit and heated. 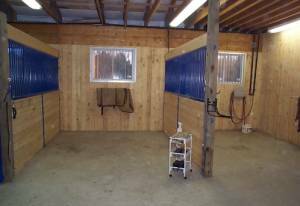 Three extra grooming stalls (10' x 12') of which two also serve as wash stalls with hot and cold water give enough space to groom your horse without blocking the aisles. The facility is under 24/7 supervision. A monitored alarm system with fire detectors and intrusion detection together with a closed circuit television system with several cameras installed throughout the barn help protect you and your horse. In the barn 25 stalls with a size of 10' by 12' are arranged in three rows. 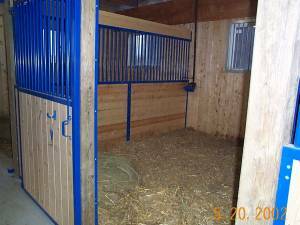 The stalls with a stone dust base and rubber mats wall to wall are bedded with lots of shavings and straw to give the horses a comfortable home. 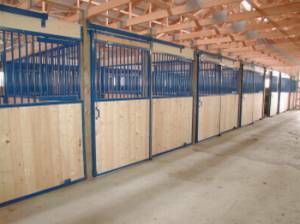 Feed doors in each stall allow easy and fast access at feeding time. We feed grain twice a day which consists of home grown organic oats and mineral supplements plus the horses have free access to hay at all times. Growing our own hay gives us the choice of green first cut Alfalfa/grass mix for easy keepers or very rich second cut pure Alfalfa for hard working and hard-to-keep horses. During the winter the horses munch on big round bales in their paddocks and in the summer they feast on our lush pastures all day long. Each horse's individual ration is calculated to best meet his needs and is adjusted throughout the year depending on the season, the horse's age and his work schedule. The stalls, pastures and paddocks also feature automatic waterers that get checked every day. To animate the horses in the wintertime to drink more water and thus preventing colic and impactions the waterers supply warm water. The water comes clean and fresh from our own well. The most impressive feature of our facility for visitors is always our 200' x 80' indoor arena. Extremely bright during daylight and very well lit in the evenings it offers incredible space for dressage and jumping. Great ventilation even during the hottest summer days and an excellent dust free footing consisting of oiled sand and hardwood shavings on top of a 5" thick stone dust base make this arena enjoyable through the whole year. Two big automated overhead doors, ten vents and a huge fan in the gable provide a well- ventilated atmosphere in the summer. The 5' high kickboards all around the arena give horse and rider a good and visible barrier and a safe feeling. In the summertime our horses love to get turned out on over 35 acres green pasture seeded with grass and white clover. 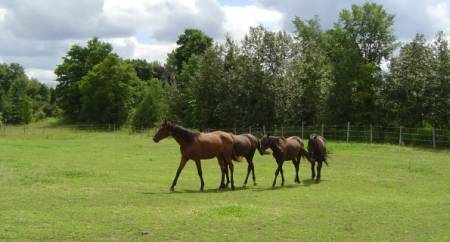 Small groups of up to 4 horses eat all day long on the large pasture fields, each between 2 and 3 acres. Having so many fields enables us to rotate the horses every month so that the old pasture can recover and grow lush grass again for the next rotation. 24 hour water supply is guaranteed by the automatic waterers installed in each field. To rest our beautiful pastures and prevent the horses from getting hurt by galloping in deep snow or slipping on icy patches they are turned out in smaller all weather paddocks in the winter. Big round bales of our quality hay still give them ample food and occupation and frost resistant waterers provide water 24/7. Fencing with electric cord powered by solar fence chargers and cedar rails keep the horses safely contained in their fields. We breed only a select few foals per year because we believe quality is more important than quantity. We use only imported bloodlines and the main focus is on breeding top notch Dressage horses for the Grand Prix ring with a big emphasis on willingness and rideabilty. Sires of our foals are famous stallions like Glock's Toto Jr, Sir Donnerhall, Donarweiss (De Niro), Balou du Rouet, Imothep and Totilas.